In our fast-paced, technology-obsessed, and career-driven society, it is becoming increasingly difficult to balance our time between all the important areas of our life. However it doesn’t necessarily have to be hard — if we are willing to shift our focus. No one believes that more than minimalist Lorilee Lippincott, and she has agreed to share her tips for keeping life simple so you can focus on what really matters. Lorilee is a wife, mother of two, and author of the book Simple Living: 30 Days to Less Stuff and More Life. Her priorities in life are her family, traveling and living simply, and she has shifted her focus to make more room for what she loves by getting rid of what she doesn’t. Lorilee describes minimalism as “intentionally having a life including what I need and what I love, nothing else.” For her, minimalism also includes having very few material possessions, but she says it doesn’t have to be that way. “I believe minimalism can go beyond material belongings and have lots of life lessons as well. What I want in my head, in my time, and in my relationships is also better when I declutter to keeping only what I need and what I love,” she said. SheKnows: What was your life like before you decided to become a minimalist and what made you decide to make the change? Lorilee Lippincott: I think we were pretty normal before we became minimalist. We were married with two kids, lived in a 2000-square-foot house, had full schedules, and tried to make it to the end of the month without running out of money. My husband and I decided to make the change because we knew we needed more time for what we really valued. We wanted time for each other, time for the kids, time to grow and learn personally, time to give back to the community and time to be involved in church. We realized we didn’t have enough time to fit it all in. When looking at our schedules we realized how much time the house was taking from us. Upkeep, cleaning, organizing, purchasing, lawn work and more added up to a lot of time. Even though we liked our house, we decided it wasn’t as important as the other areas where we wanted to spend our time. Between then and now we have gone through a lot of downsizing. It has taken a bunch of work and hasn’t always been easy, but it was definitely worth it. SK: What have been the biggest benefits of changing your life, simplifying, and downsizing? LL: The top three reasons I tell people we became minimalist is time, money, and the environment. The time it takes to keep up a small space and minimal belongings is much less now than our life before. Even though time was the primary motivator, money is very closely related. Simplifying helps save money in housing, purchasing, maintaining, and replacing. Instead of trying to make it to the end of the month without going into debt we have been able to have extra money to put toward other things we value. Though the environment is not the reason we made the switch I love that our changes also help us use less of the environment’s resources. SK: What would you suggest someone do as the first step if they want to live a more simplified life? LL: I think the first thing people need to do is really figure out the simple life that they want. What does it look like? What does it include? How will it benefit them? I think changing our thinking to wanting less is the biggest change. Once we can change our mind and thinking, the changes in our surroundings can happen much easier. SK: What would you say are the top three areas that people should focus on to make the most impact on their life? LL: Schedules: People can end up with more packed into a schedule than they can pack in a house. Keep what you need and love and stop trying to pack everything in. Horizontal spaces: What is on the kitchen countertops, coffee tables, desks, beds? When these areas are covered with objects, our eyes have so much to process and our homes feel cluttered. Expectations: I think it is good to always strive to be better, however it is important to be content with where you are on the path. SK: Being a minimalist might be considered extreme for some, so what are some small steps people could take and why do you think these things will impact their life for the better? LL: I think some people think minimalism is extreme because they see how some people live out the ideas. Minimalism isn’t about being like anyone or having less than 100 things. These ideas and examples can help, but minimalism will look different for everyone. People who say to me “I couldn’t be a minimalist” are saying they can’t live like someone else they have seen, however minimalism is living with only what you need and love. I believe this is possible and would benefit everyone… it will just look different for everyone. 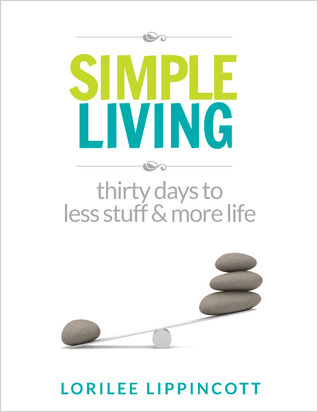 SK: In your book, Simple Living, you offer readers a 30-day guide to simplifying their lives. What has the feedback been and what are some changes people have noted in their own lives? LL: I wrote this book for the people wanting to simplify but unsure where to start. Depending on how you take the book it could be seen as a friend, a guide, or a boot camp instructor. Often people decide they want to simplify but when they look at their lives they are immediately overwhelmed and frozen. I have been excited to hear feedback on how it is helping people get started. I have also gotten feedback from people who have been inspired to really look at their life and make changes. The book has pointed out different areas that they might not have thought of before and they are seeing the benefits of simplifying. SK: Why do you think we have become so focused on things and less focused on what really matters? LL: Probably human nature. Looking back in human history there are lots of examples of people wanting more, bigger, shinier and doing anything they can to get it. I think it is even more of an issue now because of both advertising and availability. Advertising tells us all the things we need to be successful and factories keep pumping out more options than we could possibly process. Society has created a hamster wheel of spending and spending to keep up with those around us that is only going faster and faster. SK: How has your family, specifically your children, embraced minimalism? My husband and I love our new life and the freedom and time it has created. I expected to miss more of our things or our house but I have found I hardly remember what we had and I don’t miss any of it. My kids are still young and change in their opinions of life from day to day. I think it is hard for them to see all their friends living differently than they do. They love that we have more time, that I can homeschool them, that we can take longer family vacations, but some days they miss having a backyard or other house things. Surprisingly, they have taken to minimalism much quicker when it comes to their toys. When we first simplified I helped them downsize their toys, but since then they make all the decisions for what stays and what goes. They sometimes talk about wanting their own room again, but it is because they would like a quiet place to play, not because of all the toys that would fill it. I think it makes a huge difference with kids when they see their parents acting out a lifestyle. They see us living with less and benefiting from it and it is much easier for them to learn from us and follow along. SK: What has been your biggest struggle in trying to live a more simplified life? LL: I think it has been the change and how it is so different from my past beliefs and the people around me. I am a people pleaser and spent my school years trying to blend in. I struggle with knowing what I want for my life and family and wondering if I can trust my own judgment. Am I missing something? Have I thought it through enough? This has gotten much easier the more we have simplified and benefited from the changes. I still struggle with being different than those around me but I truly believe we have made the right decision for our family.